Marian Call Adventure Quest: The Quests! 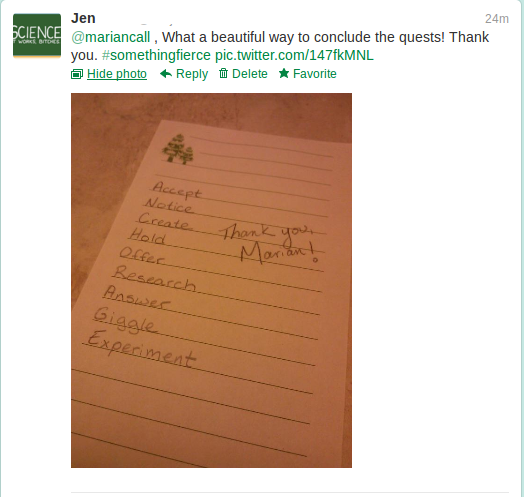 Marian Call’s album release happened this week, which means the Adventure Quest game is completed and my entries submitted for her consideration. As promised, I will share my entries with you, along with explanations when necessary. The instructions for the Quests are taken (and abbreviated, for the most part) from Marian’s European Adventure Quest website. 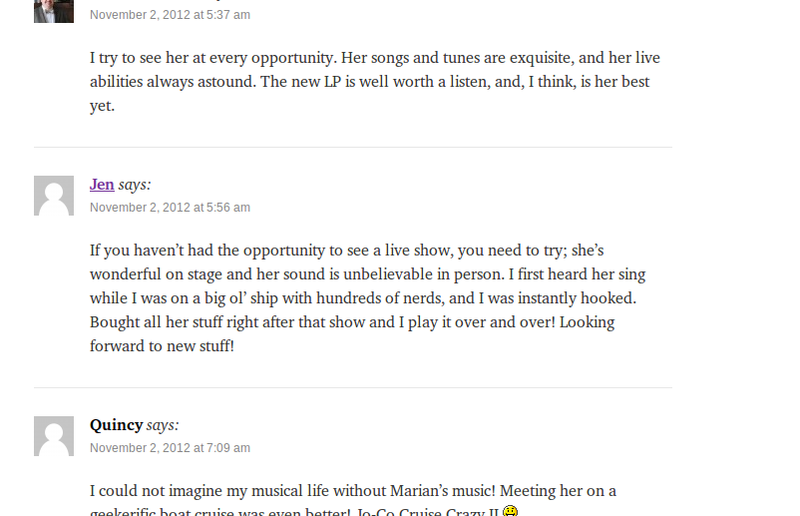 The Quests mostly involved commenting on an album review or a blog entry about Marian’s music. I’ve cut most of those out of the instructions because this post is getting tremendously long and my cut & paste was dropping the links. The first word of your comment must begin with the last letter of the last word in the previous comment. All of the words in your comment should begin with the last letter of the previous word. Example: “I imagine every young gopher requires starch heretofore.” But you should write about the music, of course. Ready? GO! This was harder than I thought it would be, and my entry is pretty short. 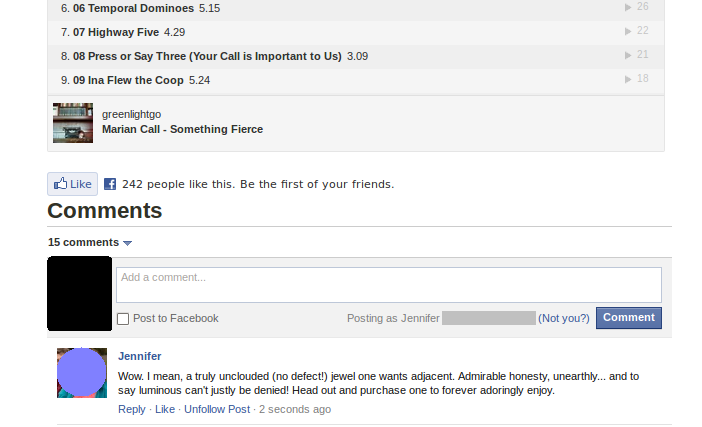 (I’m “Jennifer” or “Jen” in these screencaps). Your comment, however, may not contain the letter M or the letter C — yet it must be at least twenty words long. Do you have any idea how hard it is to comment about Marian Call’s album release when you can’t use “music” or “album” or “record” or “CD”, or even the woman’s name? Here are your guidelines today: your comment must include, in order, the letters in the abbreviations for the elements of the periodic table. First H, then He, then Li, then Be, and so on. The letters do not have to begin words, they can be anywhere within a word — your first H doesn’t have to begin a word, and He could be in the middle of “the” — but every letter pair must be preserved. You cannot separate the L and the I in Lithium, for example. Where you have two letters that don’t go together so well, such as Mg or Zn, you may use a space between them — but never shall they be separated. Dig as deep as you like into the periodic table, only a few elements or dozens of them. Write a short but very positive thought. It can be directed at the album release, a lyric from the song you most connect with, a note for the folks in the US and around the world currently needing electricity and gas and food and health care, or encouragement for the crying child who wants the election to end – it can be anything, long as it’s sincere and not snarky. Copy and paste your happy thought into http://translationparty.com. Choose your favorite permutation of the translation (doesn’t have to be the final equilibrium post) and post it at this album review from the UK if it’s about the music. This one was easy. I had a purring Mojo on my lap when I opened up these instructions, and that’s a terrifically happy thought right there. Write a comment in which each word of the comment starts with the consecutive letters of a Marian Call song title, (E.S.B. might be “Excellent song, bro”). Create an acrostic with your comment from the name of any MC song you choose. Longer song titles will of course make for longer comments. I chose her songs “Got to Fly” and “Free Bird”. 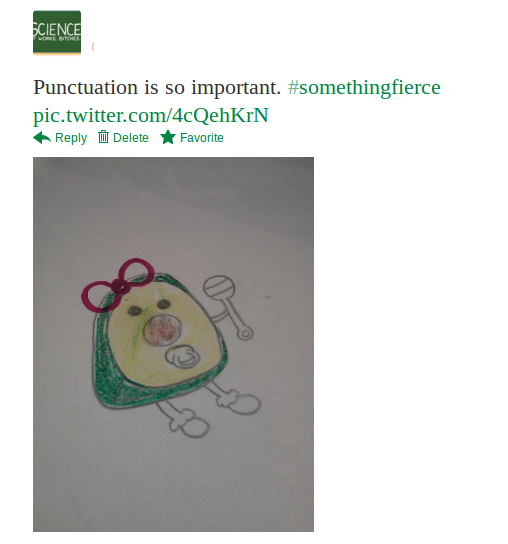 I chose to go with the obvious pun and use the lyric “You’re my Avocado, Baby”. I drew a baby avocado. It’s adorable. Let the digits of pi dictate the number of letters in each word of your comment. First word gets three letters, next word one letter, next word four — etc. Zeroes should be punctuation; use commas or periods or semicolons or dashes (you may use punctuation anywhere else too, but you must punctuate where a zero appears). The last one was nice and easy, just a fun little doodle. But this? Damn, Marian, you made this one tough! Keeping track of which digit I was at was making me crazy, and there’s a chance I’ve missed one and disqualified myself. But I tried! This one is by far the most nonsensical of my comments. Leave a comment at least twenty words long. Your sentences much be complete, with subjects and verbs, and they must more or less make sense — but you may use only words from the titles of Marian Call songs. Cover songs are all right, and parenthetical or secondary titles are certainly valid. My first try didn’t have “complete” sentences, so I had to go back and leave a second comment. Your task today is a creative writing assignment. Make some poetry. Rhymed or unrhymed, limerick or haiku or sonnet, song or epic. Your topic: “The bravest thing.” It can be about the bravest thing you ever did or hope to do, or it can be fictional. Mine was very short, because I wanted to be able to share it on Twitter instead of making a blog post for it. Listen through any Marian Call song (originals only) for the 42nd word. Compose a question for that word, an Ultimate Question of your own, that can be answered only with your word. Visit Marian’s collaborative music video with Awkward Embraces, a fantastic web series about a nerdy girl who tries her hardest to face the #wretchedhiveofscumandvillainy that is the dating world. Post the video on your Facebook or link it on Twitter, if you like — I would be very much obliged, this is the best possible way to get some NOVEMBER 13TH 2012 buzz (though that part of the task is optional). Once that’s done, leave a comment on the video. Your comment must include at least two of these four things: 1) a kind of animal; 2) a color; 3) a food; 4) a place name or specific geographic reference. Most importantly, your comment must include each of the last five words in the previous poster’s comment. They do not have to be in order or consecutive, so sprinkle them wherever you like inside your own comment. If you wish, strategically leave five words at the end that you want to inflict on to pass on to the next player. I took strategy to heart and tried to be evil for the next poor sap, but three other people posted at almost the exact same time as me, so people could choose from those instead. Dang. My comment is at the top. I had to use the last 5 words of the post below. TASK THE ELEVENTIETH: WHAT’S IN ITS POCKETSES? Your comment must be in charcter, and it must be a character from one of the works listed below. In character, tell listeners which song from Something Fierce is your favorite and why. We ought to be able to guess your character — you are posing us a riddle — but try not to make it too obvious. Minor characters, like Yellin or the Borg Queen, are less obvious and extra fun. Both book and film interpretations of characters are acceptable. Too obvious, perhaps, but it was so much fun to write! Today I had a task for you about emailing your local radio stations and things, doing important minion-y work, but in light of some journaling I did on the airplane today I have changed my mind. Today’s task is for and about you. You have been doing enough about me, blogging and posting and all. This one is for you, and for everyone, and I hope you will keep it. You are important to me and I’m thankful for you. Choose a Marian Call song title or parenthetical title from Something Fierce. Use the letters of the song title like an acrostic; each letter in order will begin a list item. Create a list for yourself of Happy Thoughts, of things you do that make you truly healthy when you do them — think action words. List only things you enjoy doing, mind, this is not a to-do list. The results should be uplifting, not discouraging, and should include things you already do often as much as things you wish you did more. If it’s not too personal, take a screencap (if your list is digital) or a photo (if your list is on paper) and share it on Twitter using the hashtag #somethingfierce or on your own Facebook page. Feel free to post individual items on Twitter. Post the list somewhere you can readily see it, and try to look at it, in an affirming and not discouraging way, on a regular basis — try not to let it become invisible. Remember what you feel like when you do those things for yourself. Double Fierce. I’ll let my screencap speak for itself. This entry was posted in Uncategorized on November 17, 2012 by antijen. This? This was a fun recap. But the heart in her last assignment & your response to it is absolutely wonderful. Thanks for sharing.